This adorable series will make you smile as you prep for the busy holiday season! 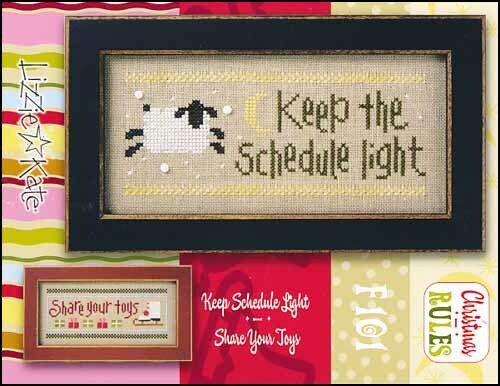 Stitch each little Christmas Rule separately, or combine them all in one giant to-do chart! This design is called Keep the Schedule Light/Share Your Toys and comes with 3 tiny white buttons and one hand-dyed red button. Stitch count 85w x 35h for each individual design. Here is what the design would look like if you purchased the whole series (6 different chart packs each sold separately) and stitched them as one entire piece. 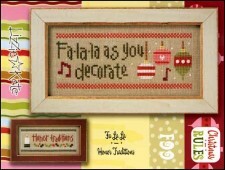 You can get the Christmas Rules Top Border and Instructions for FREE on the Lizzie Kate website.